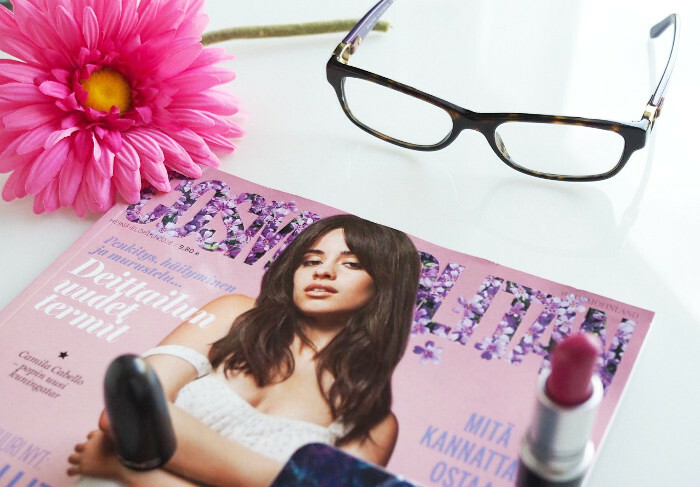 These past months I’ve had the pleasure of receiving Cosmopolitan magazine at my door. I can’t remember the last time I actually ordered a magazine, so this collaboration was really nice. For me, reading a magazine is a way to relax. Take some time for myself, put my brain on hold and just enjoy interesting articles and beautiful photos. Reading a nice magazine has been one of those small good things. Those things in daily life that don’t necessarily feel like much, but that – in the end – matter the most. Like a good cup of tea, a movie so horrible it’s actually the most hilarious thing ever, or a nice surprise in your inbox. Or a sister dropping by. Or gluten-free pizza. Or friends who lift you up and celebrate your success. Or love. I’ve been sick for the past week so those small good things have been more important than ever. What is it about being physically ill that makes your mental health drop as well? Or maybe it’s just the perfectionism in me. I’m bad at not feeling bad about myself when I feel like I can’t do anything useful. It’s ironic how my last post was about me doing so well and at the same time the heading All black everything described last week pretty well. But rather than complain, let’s get to the good things. I thought it would be fun to list five things that delighted me in Cosmopolitan. I read interviews on strong beautiful women like Christina Aquilera and Ciara. I look up to women who are not afraid to talk about difficult things, but still focus on the good. I think interviews are the most interesting thing in magazines. There was also an interview on one of my favorite rappers, Pyhimys. It’s funny how some celebrities feel important to you. But when I was going through a tough time, listening to Pyhimys actually helped me get through it. I rarely copy any outfits from magazines, but they do give me inspiration. They also give me an idea of what fashion is like currently. And obviously the photography is so good. If only I could pose like the models though. I love, love love editorial makeup, which is seen a lot in magazines like in Cosmopolitan. Some of them wearable and some of them not so wearable. I find myself staring at some of the makeup photos for so long. I never read horoscopes unless they’re served to me on a platter. Like, in a magazine. I don’t really believe in horoscopes, but I find them entertaining. And sometimes surprisingly accurate. In one of the magazines there was a test you could take to figure out which perfumes were perfect for you. Well, the poll ended up giving me a profile that didn’t suit for me, but I still found some interesting new perfumes I’m gonna check out. You’re probably not surprised, but I enjoy reading product reviews and finding new products that way. 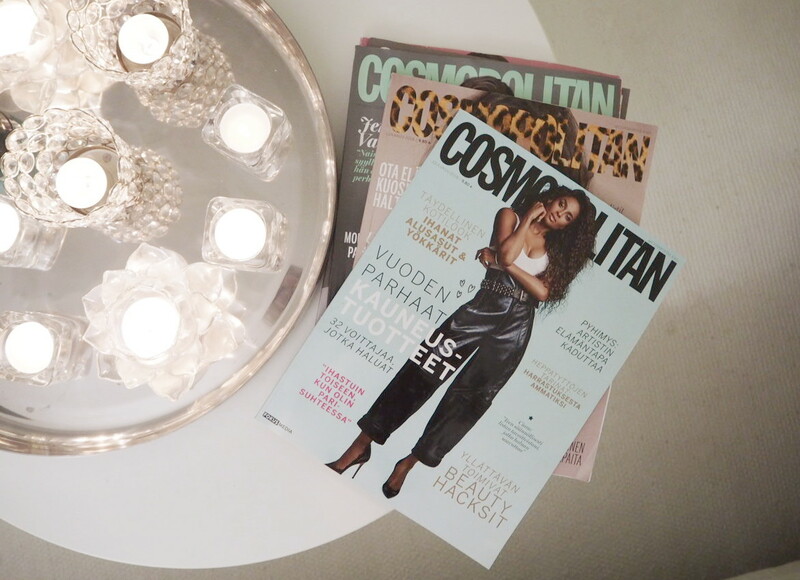 If you would like to pamper yourself or someone else – you can order Cosmopolitan Finland here. What have been the small good things in your life lately? P.S. Have you checked out my giveaway on Instagram? Or on Facebook? Those two giveaways are for Finnish residents only, but little elves tell me that there is a third giveaway coming, that might be for European residents. Make sure to follow my insta (@charlottaeve) and facebook page (Charlotta Eve)! I’m back from my holiday – hello! Good to be back. And as an update, I only got one mosquito bite, so we can conclude, that the new machine works. And also, that I was quite hysterical about bugs on our Lapland trip, successfully though. One day I got two nice things from the mail, and I got very inspired to take photos of them. One thing led to another and I decided to gather together some things, that are very nice. By the way, I once met a girl whose last name was Nice. I said to her, that that was nice. She agreed, that it was indeed nice. It was awkward, and I can only imagine how many times she had heard that. Yes, I’m that person, who wants her name on things and then wears those things. My sister tried to convince me to come up with some Finnish word for the cases, but I stood my ground and went with Charkku. That is my nickname and almost everyone, who knows me, calls me that. I wanted to show these cases here, because I was very impressed with their quality. 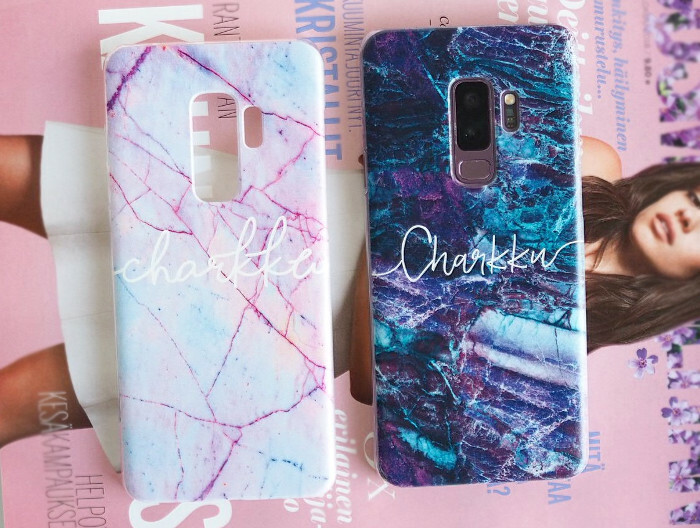 I think it’s pretty cool you can get two phone cases with your own text, for £10,42, with free postage from Ebay. 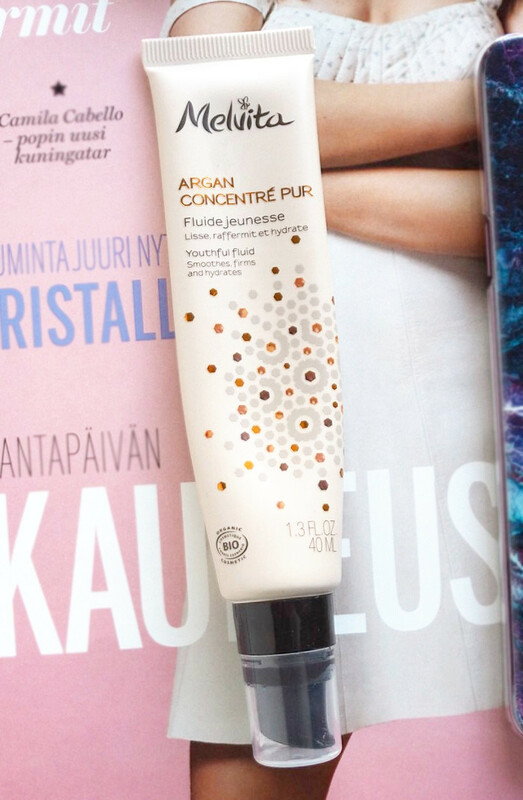 I got this fluid as a pr-sample, and it was love at first sight. This light fluid moisturizer is perfect for my skin. It contains argan oil, which you know, seems to be the solution to almost anything. It’s not only anti-ageing, but it’s also acne friendly. Argan oil is a friend, whoever you are. And when it’s combined to this awesome consistency and a beautiful (and handy!) packaging, I really have no complaints. I use this as a lotion, and especially during summer it’s enough for me as it is, but sometimes I use it as a serum, and apply some other moisturizer on top of it. MAC lipsticks are nice. And this bright pink shade, Girl About Town, is very nice indeed. But I’m gonna make an exception here, and tell you, that I also kind of dislike MAC lipsticks. I have a weird relationship with them – on the other hand, I love their packaging, their scent and the good quality of them (great pigment, and smooth consistencies). But then again, they dry out my lips. Not like crazy, but enough, that I notice it. Even my Cremesheen one does that. I’m wondering – am I the only one? 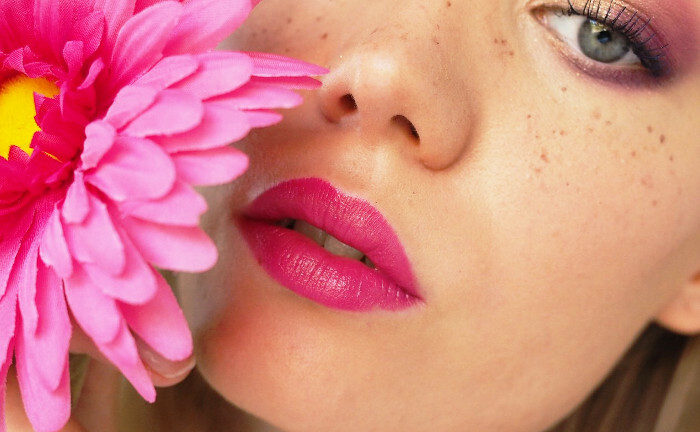 Have you tried MAC lipsticks, and noticed that? 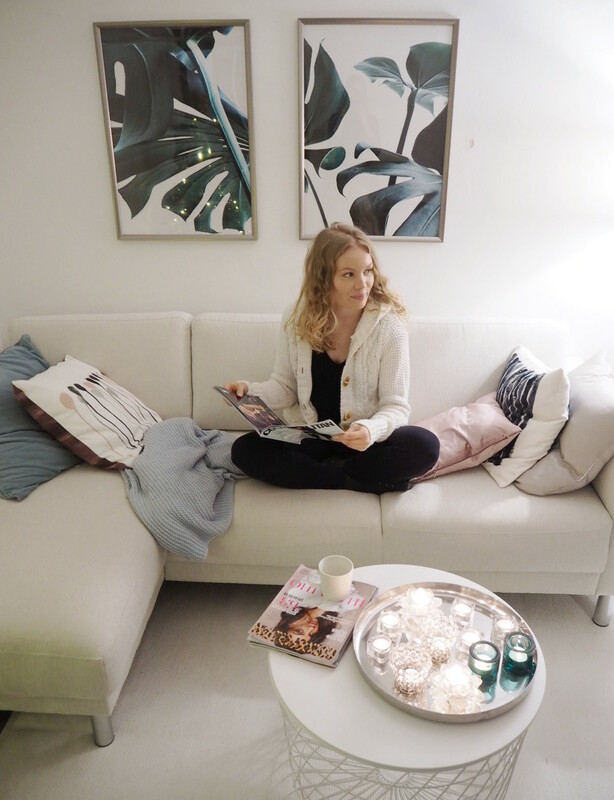 I started a collaboration with Finnish Cosmopolitan and I will be receiving magazines for some time now. Yay! It’s been ages, since I ordered any magazine. There’s just something nice about having a physical magazine, that you can read – and perhaps enjoy a nice cup of coffee with it. You’ll hear my opinion on the magazine and it’s content later on. Now – I challenge you to tell me one nice thing from your day!